A joint Spanish and Egyptian archaeological team excavating the area around the tomb of 18th Dynasty official Djehuty in the Dra Abul-Naga necropolis on Luxor’s west bank has unearthed a beautifully preserved wooden sarcophagus decorated in an elaborate feather design. This coffin type is known as a Rishi coffin, rishi meaning “feathers” or “wings” in Arabic. Anthropoid wooden coffins shaped like humans with linen-wrapped bodies painted in feathers first appeared in 13th Dynasty (1803 – ca. 1649 B.C. ), but the oldest ones surviving date to the 17th Dynasty (ca 1600 – 1550 B.C.). 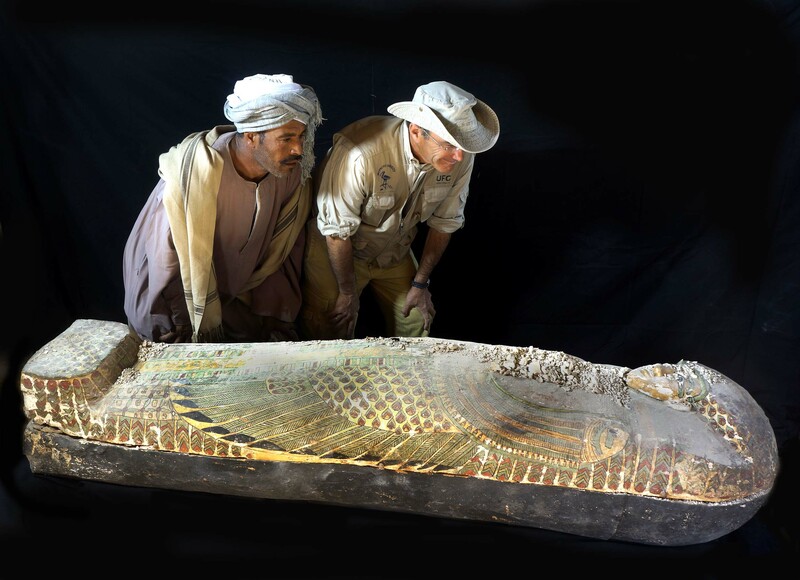 Archaeologists believe this coffin dates to around 1600 B.C. 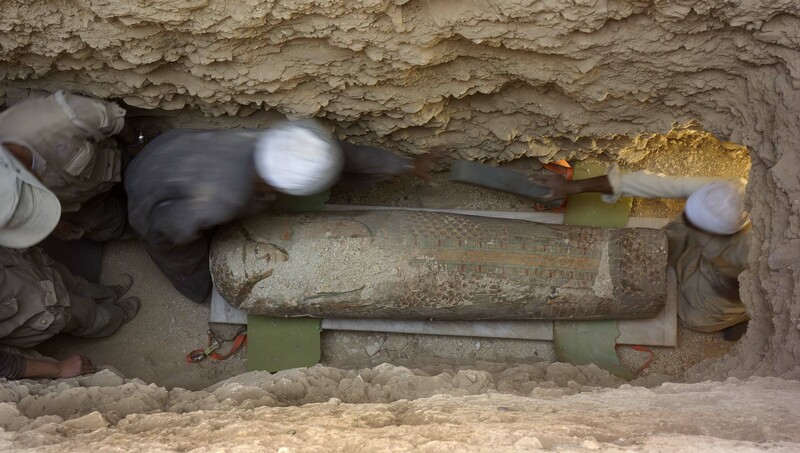 This is the 13th season of excavations in the north section of Dra Abul-Naga where Djehuty, overseer of the treasury of Queen Hatshepsut (ca 1470 B.C. ), was buried. This year’s work began in January. The team found three burial shafts, the first two of which had been broken into in antiquity. The third burial shaft was dug four meters (13 feet) into the bedrock ending in a chamber that was found still sealed with uneven mud bricks. When excavators removed the bricks, they discovered the rishi coffin inside. The coffin is two meters (6’6″) long, 50 centimeters (20″) wide and 42 centimeters (16.5″) high. It was discovered intact with the paint colors still brilliant. The feathers drawn on the lid represent Maat, the Egyptian creation goddess of truth, order and law, who weighed the soul of the dead against an ostrich feather to determine whether they would reach the afterlife. The sarcophagus is painted to look like the body is being wrapped in paid of wings, like Maat, who is sometimes depicted with feathered arms, is holding the deceased from behind in a protective embrace. A funerary inscription stretches from the chest of coffin lid to the foot. It prompts offerings to a man named Neb, presumably the inhabitant of the coffin. His full name and exact titles have yet to be deciphered, but he was a high ranking official of the 17th Dynasty. 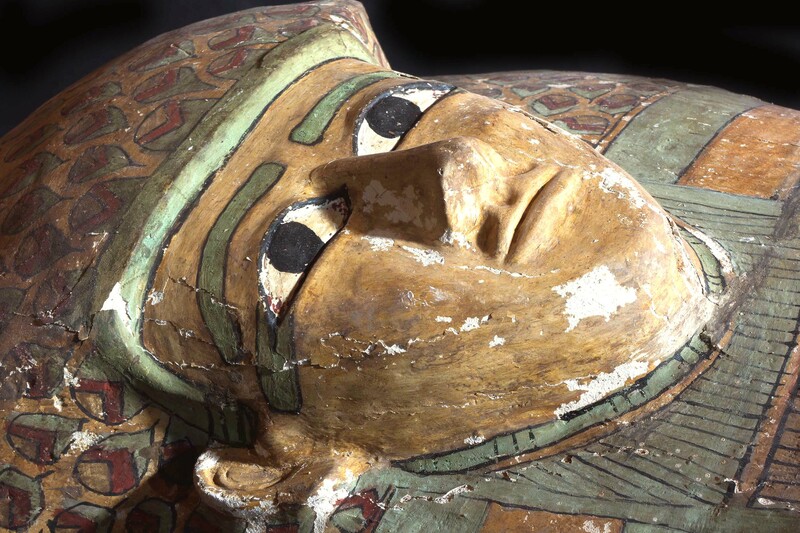 The mummy is still encased within the sarcophagus and appears to be in good condition. 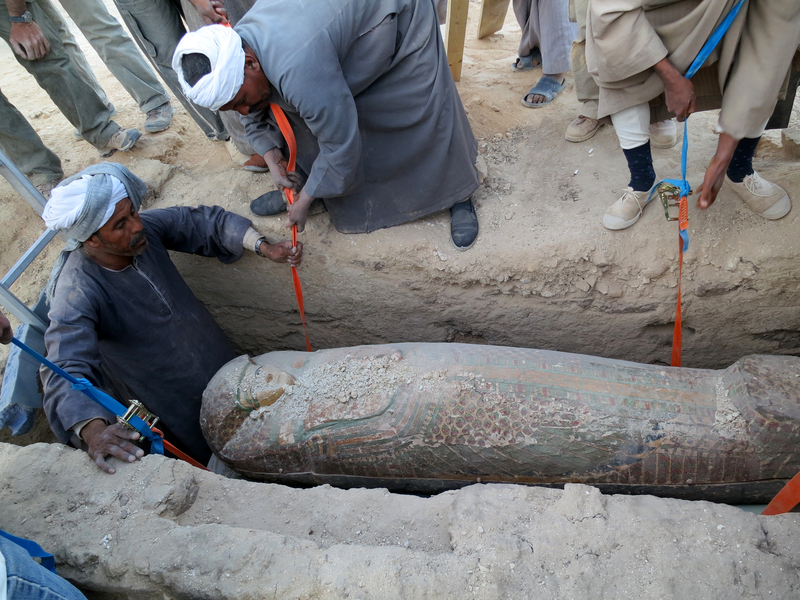 This finding, along with others conducted in the same area, confirm that Dra Abu el-Naga was where were buried the members of the royal family and their courtiers Dynasty XVII, 1600 B.C. A little known period and at the same time, key to understanding the origin of the Egyptian empire, and the structure and functioning of the administration in the new capital city of Thebes. For more about the Djehuty Project, including excavation diaries for each season and photo galleries (almost all of which is in Spanish), check out the website.